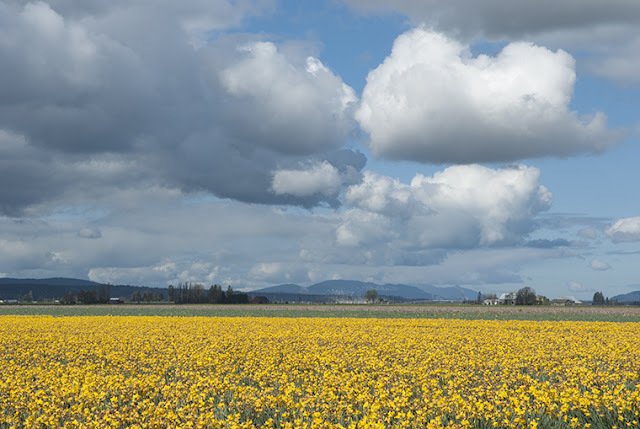 This past weekend was our annual Skagit Valley Easter trip. It was an early Easter this year, but luckily an early spring as well. The daffodil fields were just passing their prime, and the snow geese were still in the area. A huge flock can (sort of) be seen at the center horizon line. They could certainly be heard! We chased after them for a closer view, but couldn't find their location. The elusive snow geese! Photography was a little rough overall on this day; I was happy to have the morning clouds clear a bit, but the sun was blindingly bright. Guess I forgot how to photograph in sunshine after our long, gray winter! :/ Ok, no complaint though. The sunshine was awesome!!! Finally a break in the weather! We had some sunshine over the weekend, and actually had already planned a trip to Goldendale just to get on the sunny side of the gorge. On our way back, we stopped for a hike at the old Lyle Cherry Orchard trail. No orchard visible here, although I read there are some old cherry trees at the top of the trail. We only made it part way up because we didn't allow enough time to do the entire trail. We got through the steepest climb, and the part way up the remainder of the climb along the plateau, which my guide book called the "Layer-Cake Bluffs". Pretty view, with the grass greening up a bit, and the powdered sugar clouds covering the sky. An abundance of water heading over all the falls in the gorge this year. We've already exceeded average yearly rainfall totals for 2016 (measured by our rainy season, starting October 1, 2015 through September 30, 2016). Very green and very soggy! I love all the moss and (I think) lichen in this scene. It was the orange that caught my eye. 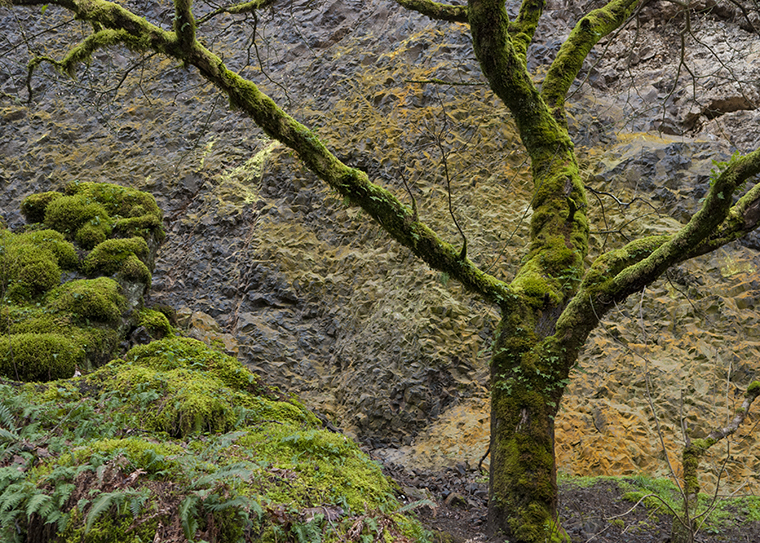 I'm assuming it is some sort of lichen along a cliff wall near Oneonta Gorge. Signs of spring all around, including in the skies. 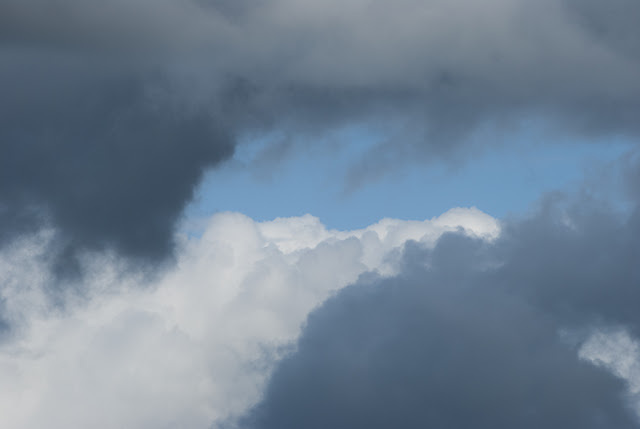 Weather patterns are rolling through quickly this week, rain then sun then clouds, etc. Rainbow weather. I could see a sheet of rain falling yesterday afternoon, even though we had sunny skies, and thought that someone was getting a fabulous rainbow. It wasn't my lucky day though. 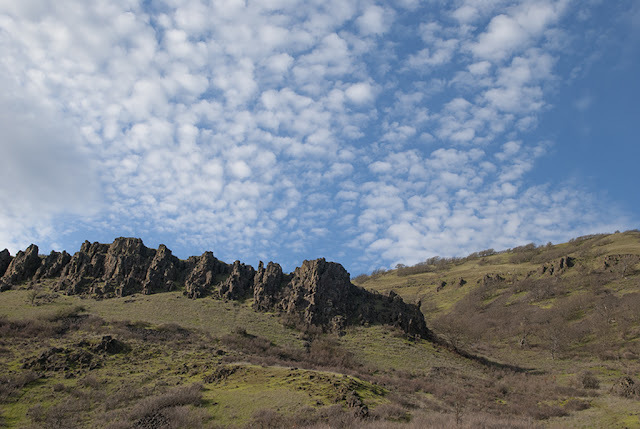 The Tom McCall Nature Preserve trailhead begins at the Rowena Plateau, shown here, and continues up to Tom McCall Point. I was hoping to capture a panoramic view of this plateau overlooking the Columbia. This ended up being my favorite image, but it doesn't really show the Columbia, so that's something to work on for my next visit. 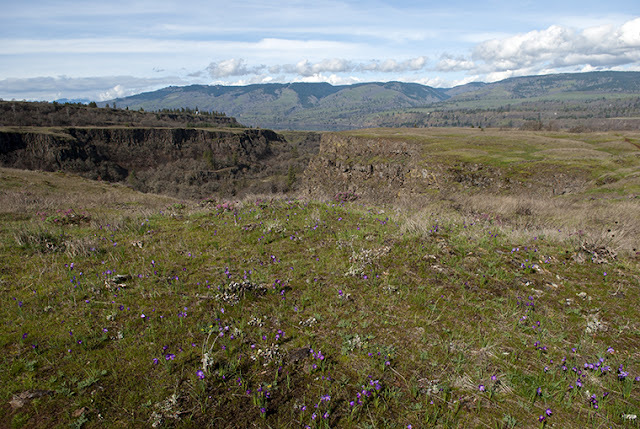 It does show the cliffs and plateau, and according to my instructor, this geology is one of the features that makes the Tom McCall Preserve one of the more pristine wildflower locations in the gorge. The geology made this area unfit for grazing, which apparently introduces non-native and invasive species into the fields. At the entrance to the trailhead there is a boot-scraping device with a sign requesting visitors to clean their shoes before and after hiking in order to keep seeds or pests from spreading into the fields. 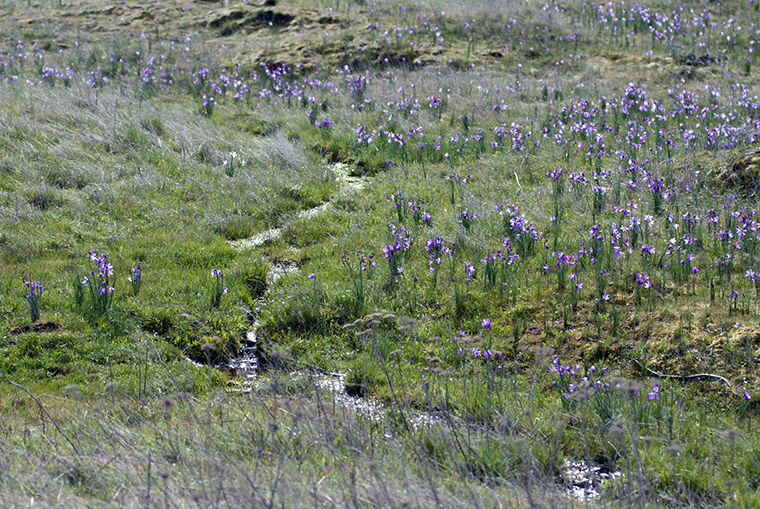 A wider view of the Sisyrinchium from my wildflower field trip yesterday at Tom McCall Nature Preserve. Not sure how this flower got the name Grass Widow; it was by far the most common flower we saw, carpeting stretches of the plateau. This flower will continue blooming in the gorge at higher elevations each week. As a rough estimate, 500 feet of elevation change equals a week's delay in bloom time. We were at the lowest stop, Rowena Plateau, with an elevation of about 600'. The trail continues up to Tom McCall Point at an elevation of 1500'. A change of scenery on the blog today...I signed up for a class this month called Wildflowers in the Columbia Gorge, and today was our first field trip to see what is blooming. 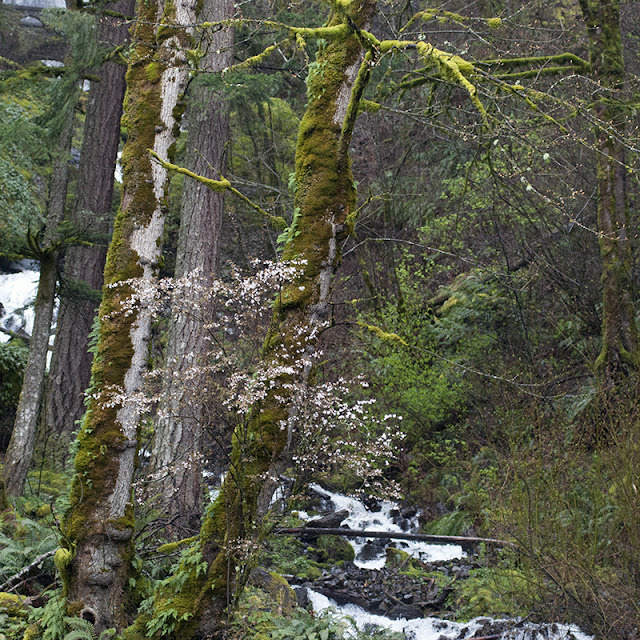 We visited Tom McCall Nature Preserve in Oregon. Lots of flowers in bloom already. I didn't know this one was called Grass Widow until I got home and consulted my field guide, because our instructor always refers to the flower by its scientific name. 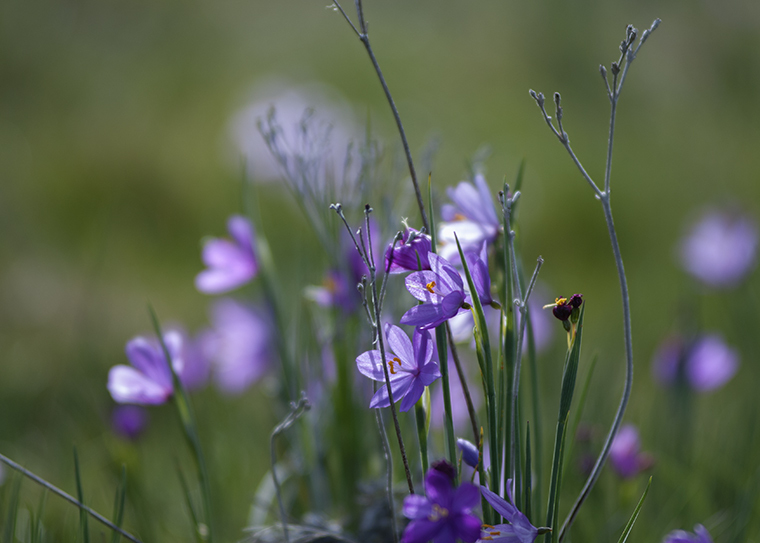 Sisyrinchium douglassii, in case you were wondering! 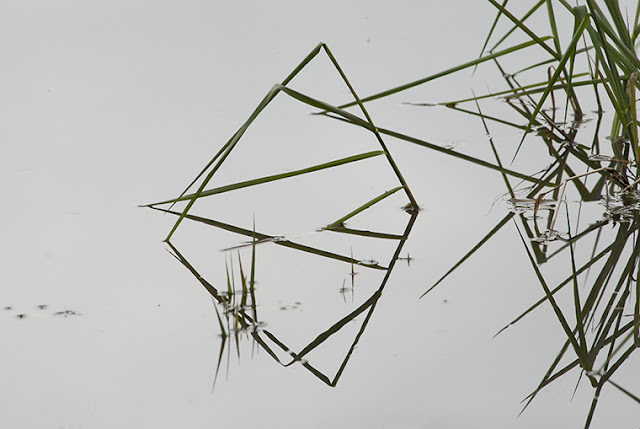 It's the more common variation, and probably the flower that we saw the most. Purple, blue, pink, or white. Oh am I ready for a change of color! 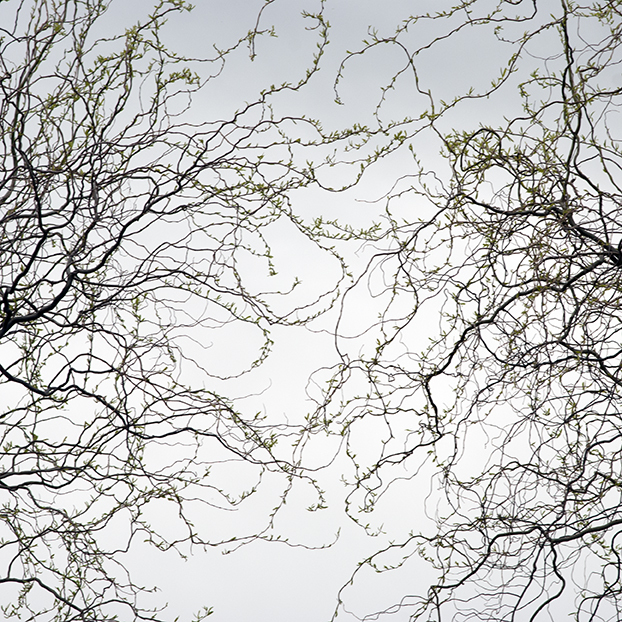 Two ornamental trees in my neighbor's yard are starting to leaf out. I think they are called Curly Willow. I like how they are starting to intertwine.